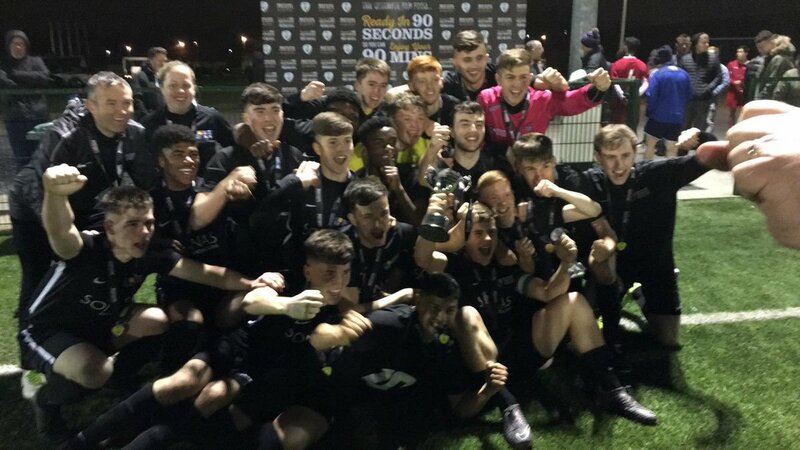 Maynooth University are the Rustlers Colleges and Universities Division Three champions for the third successive season after they managed to see off a strong challenge from Dun Laoghaire IADT in a high tempo decider at the FAI NTC Abbotstown. The Co Kildare side eventually ran out 3-1 winners but they were pushed all the way by a committed Dun Laoghaire side who contested every ball right up until the final whistle of this excellent game. Rodrigo Goncalves headed Maynooth in front from a corner after seven minutes of high tempo action. The lead only lasted another seven minutes when Dun Laoghaire were back on level terms and what a goal it was. The ball broke out to Ian Coone on the left and his first time cracking drive from outside the Maynooth area flew inside the near post and well out of the reach of 'keeper David Hayes. It was nip and tuck after this as both sides went in search of the goal that would give them an advantage. Dun Laoghaire were unlucky not to equalise on the half hour with Dylan Greally's header coming off the Maynooth cross bar. There was no let up to the tempo after the break as Dun Laoghaire piled on the pressure in their search for anther equaliser. Ernest Mwale just failed to get a touch on to a David Harris cross and a couple of Coone's well delivered corners were scrambled away by a relieved Maynooth defence. After surviving any amount of Dun Laoghaire pressure Maynooth finally got a break and substitute Glen Mulvey clinched the win in a swift counter attack with ten minutes remaining. A good advantage allowed by referee David Gallagher saw Mulvey race through the Dun Laoghaire defence and although Quinn did well to block the first shot the ball spun up in the air and Mulvey climbed above the defenders to head it home. MAYNOOTH UNIVERSITY 'C': David Hayes; Nathan Cullen, Rory McCrossan, Donagh Crowne, Jack Tunstead; Darragh Kelly, Liam Berry (Stephen Ope 89); Alex Fitzgibbon (Devine Amauan 22), Rodrigo Gonclaves (Thomas Yemusick 85), Aaron McNally; Luke O'Neill (Glenn Mulvey 17). DUN LAOGHAIRE IADT: Cormac Quinn; Jack Green (Ernest Mwale 67), Brian Sweeney, Dylan Greally, Caolan Mooney; Jack Burke, Sean Reddy; David Harris (Azehy Smko 85), Ian Coone, Louis Noone (Clewment Micheiet h-t); Dean Hutchinson (Jack Kissane 88). Referee: David Gallagher Assistants: Christy Lawrence, Ray Colreavy.